As the cheapest board on test, the Gigabyte Z270N-WiFi doesn’t have many immediate competitors, with just ASRock offering the Z270M-ITX/ac. Both boards lack the visual pizzazz of other boards on test, instead focusing on features, and In some areas, they’re better equipped than their more expensive peers. However, the ASRock does sport more USB ports than the Gigabyte. The rear panel of the ASRock Z270 mini-ITX offers six USB 3 ports compared to the Gigabyte’s four, and includes two USB 2 ports as well, meaning the ASRock has double the number of ports – the Gigabyte board has just four USB ports In total. You can, of course, make use of the Gigabyte’s USB 3 and USB 2 headers to add more ports, but out of the box. the ASRock has the clear advantage here, and it has a better-placed USB 3 header too. The ASRock board also sports a small heatsink on the CPU powercircuitry to help cool the VRMs. but it’s a far cry from the heatsinks on its more expensive Fatality-branded sibling, so neither board is an ideal candidate for everyday, sky-high overclocks. Otherwise, though, the Z270N-WiFi offers a solid set of features. You get two Intel Gigabit LAN ports, a generous helping of six SATA ports – as many as you’ll find on most full-sized boards, plus a single M 2 port on the rear of thePCB. Fan headers are often scarce on mini- ITX boards, so the fact that there are only two isn’t a surprise, although it would help to have more. There’s also 802.11ac Wi-Fi with a magnetic antenna included in the box, and while only the ASRock Fatality Z270 Gaming and MSI Z270i Gaming Pro Carbon offer a clear-CMOS button this month, Gigabyte has at least moved the jumping pins to the right edge of the PCB for easy access. In terms of performance, the Z270N-WiR managed to pip the ASRock Z270M-ITX/ac to the post at both stock and overclocked speeds in RealBench. but only by tiny amounts. In fact it was only in the audio tests where the two boards showed significant differences. The ALC1220 audio codec on the Gigabyte board was in a different league to the ASRock, with a dynamic range of 111dB(A) compared to 92.4dB(A), with a similar difference in the noise test too. 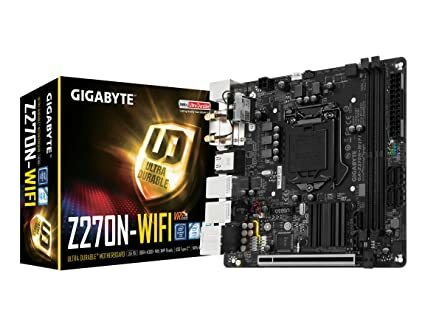 The Gigabyte Z270N-WiFi might have fewer USB ports than the similarly priced ASRock Z270M-ITX/ac, but it’s easier to overclock, has slightly better software and much better-performing audio. It doesn’t have the fancy looks of some of the premium boards, but it’s your best option for an affordable Z270 mini-ITX motherboard. A solid set of features and the cheapest price on test make the Z270N-WiFi our top-choice budget Z270 mini-ITX board.